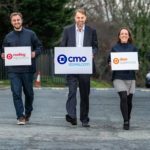 Formerly known as Construction Materials Online, the £39m business is now to be known as cmostores.com. The business, which grew sales by 46% in 2018, uses an online platform and direct shipping to supply the construction market with building materials. The company has 70,000 products available online. It has also announced the launch of a new trade club to allow customers to apply for a trade credit account offering exclusive incentives and discounts. In addition, a new trade website is planned for 2019, to give trade customers a personalised portal with streamlined ordering, simplified paperwork, speedy quotes and invoicing, and a hotline to an account manager.